Below is an excerpt from my travel blog. Cheers. The most stunning mountain range runs from the foot of Queenstown directly north. It's called the Remarkable Mountain range because it's quite simply one of the most stunning mountain ranges out there. Located just outside Queenstown, the range creates a 'remarkable' backdrop to the picturesque Lake Wakatipu. 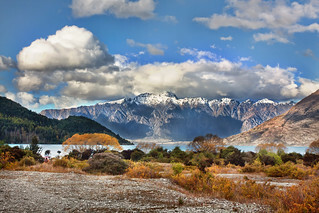 From this view, the small green mountain protruding into the lake hides the city of Queenstown. People often ask me if I was scared on the first day of my trip around the world. I wish I had this photo handy on me when they ask this question. I took this on my first day in New Zealand. Upon seeing this magnificent landscape every worry in my head had gone away. The last item on my mind was where I'd be sleeping that night or how I was going to pull off this trip. Nature has a funny way of providing calm.